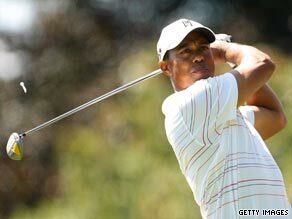 Tiger Woods is set to claim his third Buick Open as he leads going into the final round at Warwick Hills in Michigan. Woods battled to a seven-under 65 in his third round of Saturday, often relying on remarkable recovery shots, to total 17-under 199. His nearest challenger Michael Letzig double-bogeyed the 18th hole to fall one behind the world number one. Woods is an incredible 46-3 and 35-1 on the PGA Tour when leading a tournament going into the final round, but his opponents will take heart from his errant play on day three, despite his fine score. “The whole idea of the game is to put the ball in the hole, I did that,” he told the official PGA Tour Web site www.pgatour.com. “But as far as controlling my ball, I didn’t do that … and got away with some shots. I was able to put myself in position to make a couple of putts, and I did.” Woods, who won the Buick in 2002 and 2006, moved into a tie for the lead on the 17th when he rolled home a 33-foot birdie putt. Letzig, playing behind Woods, got to 18-under, but a double bogey six at the 18th when he failed to get out of a greenside bunker, saw him end the day in second place. He is a shot ahead of 36-hole leader John Senden (71) with Matt Bettencourt (65) and Vaughn Taylor (69) tied for fourth at 14-under 202. Scott Piercy charged to a best-of-day 64 to be tied for ninth. Woods is playing his first tournament since missing the cut in the British Open at Turnberry and is bidding for his fourth win on the PGA Tour this season after coming back from knee surgery. Woods, who is making his ninth Buick Open appearance enjoys the experience. “The people here have been absolutely incredible, so supportive of this event over the years. That’s one of the reasons why we love coming here.” He will play in the final round with the unheralded Letzig, who will be bidding for his first PGA Tour win.